Shopping at flea markets can be inspiring and fun; for some, it can be a bit overwhelming. Over the years, I have found many interesting accessories for my home and fabulous, unique gifts at flea markets all over the world. 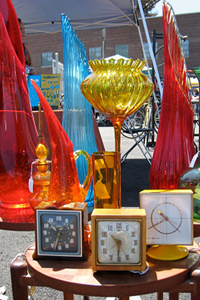 Here are some quick tips on how to find hidden treasures at flea markets! First and foremost, start your shopping adventure with an open mind, and don’t go hunting for a specific item. The best things are always found when you are not looking for them. Just think about when you are shopping for a dress for a special occasion: You seem to find it not when you are shopping for it, but when you least expect to. The same applies to shopping in flea markets. Just walk in and let yourself be inspired. You will most likely find something that is unexpected, beautiful and just right. Don’t go with a shopping list of items to find. Flea markets are great places to flex your creative muscles. When shopping, don’t think only about the function the objects were originally intended to perform. Instead, think about how you can repurpose the item and redefine its function for you and your home. For example, interesting vases can be grouped together as sculptures to create a charming vignette. Old wooden boxes can be used as planters to display dried or silk flowers — or even moss for a more contemporary look. An old scale can be used to hold fresh fruit in your kitchen, and crystals from a broken or used chandelier can be strung and used as a necklace. There are so many possibilities. Let your imagination run wild! Remember that you can usually negotiate prices at flea markets. If something is priced beyond your budget, talk to the vendor and inquire how low she is willing to go on the price, then make her an offer. Keep in mind, though, that many vendors don’t take a very large mark-up, so be fair. Bringing cash also makes negotiating easier. I always end up finding things I otherwise would have missed when I take my time. 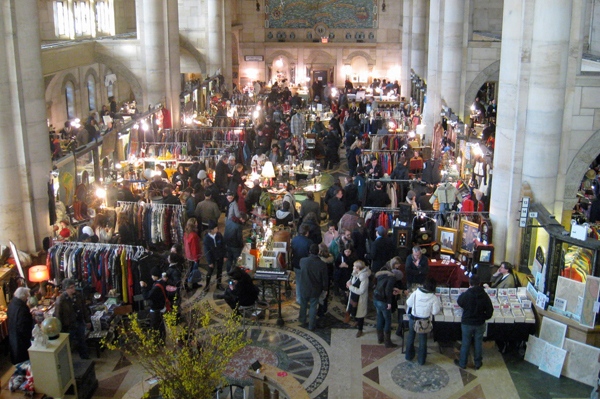 There’s a lot to see and sort through, so don’t rush your flea market experience. And my most important tip of all: Remember that “the hunt” is almost as much fun as bringing home something that you love. This local TV commercial for the Montgomery Flea Market has garnered national attention due to its catchy jingle.